John Andrew Dixon created a montage-style painting for the most recent commemorative poster after collaborating with local artists Sheldon Tapley and Paul Sirimongkhon on earlier poster designs. As the 2007 featured artist, Dixon had the opportunity to “partner” with himself, and to also produce spin-off images for use on attire and souvenir pins. The festival’s new executive director, musician Elaine Hammonds, shared his regard for what makes the festival unique, the quality and variety of the music and instrumental performers. “I wanted to communicate what has always been the heart of the festival for me, the magic and diversity of the music and the extraordinary level of performance. I chose the medium of watercolor, as it lends itself to an illustrative montage, and I have long experience with that style. I knew it was the ideal look for a dynamic subject like entertainment promotion,” Dixon explained. For his first solo exhibition in five years, John Andrew Dixon reveals his passion for collage as a fine arts medium. He was led to attempt large mixed-media works after having produced hundreds of spontaneous “miniatures” in the form of personalized greeting cards over the course of several years. “The intuitive process is endlessly intriguing to me,” he explains. “By composing found material and the remnants of everyday life, I can explore the connections between visual form and symbolic communication. The improvisational aspects of collage provide an ideal creative balance to my analytical assignments as a graphic design professional.” Throughout the exhibition, the artist cohesively blends iconic images with mundane cultural fragments to suggest multiple layers of meaning. “Nearly anything can be made beautiful, be infused with positive messages, or be brought into a contributory relationship with our daily awareness through aesthetic sensitivity and creative ingenuity,” according to his artist’s statement. Dixon begins each piece quickly and with few, if any, preconceived notions, selecting from an extensive “morgue” of visual components and a repository of accumulated “scrap.” He admits that access to his “inordinately huge” volume of categorized resource material allows him to remain spontaneous during the formation of a collage. Dixon Design earned first place in the rack brochure category at the Kentucky Tourism Council’s annual conference in Frankfort. 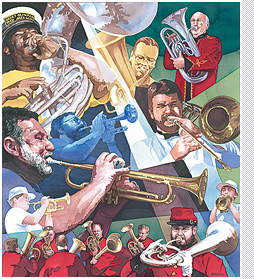 Developed to attract visitors to The Great American Brass Band Festival, the 3-panel self-mailer previewed the schedule of performances and associated events. After a 10-year hiatus from direct involvement, the studio rejoined the community effort to maintain excellence in all aspects of the event, from performances to promotion. 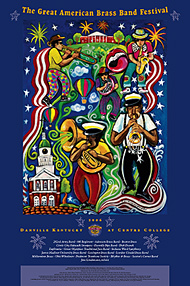 John Dixon designed a new commemorative poster format and suggested returning to the festival’s original visual theme, as well as typography from brass band music’s “golden age.” This approach was used for the award-winning rack brochure and a more cohesive approach to souvenir merchandise. According to Dixon, “We recommended they return to an emphasis on their traditional festival brand,” referring to the original logo and color scheme created by Stuart Arnold, formerly of Danville.